A modernization of Shane, Malone features a stoic Burt Reynolds performance but is an otherwise mindless low-budget action flick. CIA-trained assassin Malone (Reynolds) is tired of killing and attempts to disappear into rural Oregon. At a remote gas station operated by Paul Barlow (Scott Wilson) and his daughter Jo (Cynthia Gibb) Malone learns that the entire nearby town is being intimidated by henchmen working for shady political operative Delaney (Cliff Robertson), who wants to buy and control the valley for nefarious reasons. Malone tangles with Delaney's goons, including Madrid (Alex Diakun) and dim-witted brothers Calvin and Dan Bollard (Tracey Walter and Dennis Burkley). The local Sheriff Hawkins (Kenneth McMillan) is also on Delaney's payroll. Word of Malone's violent interventions reaches Delaney, who orders Malone killed. Meanwhile, the CIA track down Malone's whereabouts and dispatch agent Jamie (Lauren Hutton) to clean up the mess. Directed by Harley Cokeliss and based on the book Shotgun by William P. Wingate, Malone is an unashamed but uncredited update of the Alan Ladd western classic. The story of a mysterious man trying to walk away from a violent past finding himself in the middle of a land dispute between settlers and profiteers carries sufficient weight to maintain a basic level of interest. 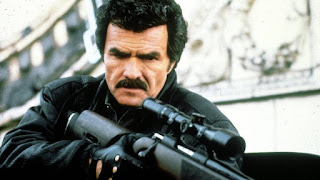 Meanwhile, star Burt Reynolds abandons any remaining vestiges of good ol' boy charm and instead generates solid intensity by sticking closely to steely-eyed assassin mannerisms. Unfortunately, not much else in Malone works, and the film has a strong whiff of being a decade late and a few dollars short. Malone cannot shake a relatively witless script and utterly predictable Chuck Norris-calibre set-pieces previously seen in better movies, including a barber shop showdown lifted straight from High Plains Drifter. Although definitely older than Shane's Joey, it's never quite clear how old Malone's Jo is supposed to be (Cynthia Gibb was 24 at the time, but portraying a curious teen). This starts to present a problem, as Jo develops a crush on the assassin and the film edges towards icky and borderline exploitive territory (Reynolds was 51). Other than the dependable Scott Wilson, the rest of the cast is made up of countless hissing villain and doofus redneck types, all responding to the commands of Cliff Robertson's Delaney. His heinous plot, something about establishing white supremacist enclaves across the country, is half-heartedly explained a couple of times, but still does not make much sense. If the intent is to quietly create command centres through strategic land acquisition, running around and killing people in broad daylight is not the way to avoid attention. Malone at least often looks great, Vancouver and various small-town rural British Columbia locations (standing in for Oregon) giving the film a scenic shine. The story may be old and the budget limited, but the lush northwest mountains and valleys are always spectacular.